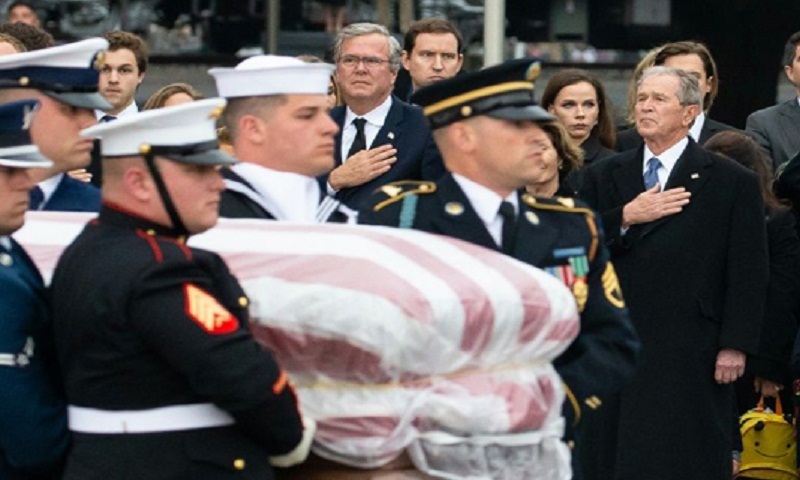 After a state funeral Wednesday in Washington that was attended by the country’s five living presidents and foreign dignitaries, Bush’s flag-draped casket was flown to Texas for a final farewell. A compassionate national spotlight had shone on Bush’s passing and the memorial proceedings throughout this week. But his burial at Bush’s presidential library center in College Station, Texas — alongside Barbara, his wife of 73 years, and their daughter Robin who died of leukemia at age 3 — was a private family service. “The 41st President of the United States of America, George Herbert Walker Bush, has reached his final resting place,” family spokesman Jim McGrath posted on Twitter. Bush, who died Friday at age 94, lay in repose at St Martin’s Episcopal Church in Houston, where he was eulogized at a final memorial service by close friend James Baker, who served as his secretary of state. “His incredible service to our nation and the world are already etched in the marble of time,” Baker said, highlighting the sense of duty, service, and personal grace that drove Bush. Son George W. Bush, the nation’s 43rd president, appeared somber at his wife Laura’s side, and stood ramrod straight as military pallbearers carried the casket from the Houston church to a waiting hearse. It was then placed on a train — with a locomotive painted in the colors and pattern of Air Force One, the presidential jet — for the final journey to the presidential library, part of a precise series of ritualized events. At Wednesday’s service in Washington, President Donald Trump and First Lady Melania shared a front row pew in the National Cathedral with past presidents Barack Obama, Bill Clinton, Jimmy Carter and their wives, to honor Bush.